Get the best price online when you purchase the 1/10 oz Australian Kangaroo gold coin through our online store. At 9999 purity, it is one of the finest gold products available from the Perth Mint. Each year a new design is released and their limited production makes them an interesting investment option for those interested in bullion and numismatic value alike. The reverse of the 2010 Kangaroo Gold coin features two kangaroo's in combat with the traditional "P" mintmark. The obverse features an effigy of Queen Elizabeth II and the words "Elizabeth II Australia 15 Dollars". These coins will arrive beautifully encased, ideal for an investment or a gift. Reverse Two kangaroo's in battle in the outback and the words "Australian Kangaroo 2010 1/10 oz 9999 Gold"
Two kangaroo's in battle in the outback and the words "Australian Kangaroo 2010 1/10 oz 9999 Gold"
1/10 oz 2010 Australian Kangaroo Gold Coin Get the best price online when you purchase the 1/10 oz Australian Kangaroo gold coin through our online store. At 9999 purity, it is one of the finest gold products available from the Perth Mint. Each year a new design is released and their limited production makes them an interesting investment option for those interested in bullion and numismatic value alike. 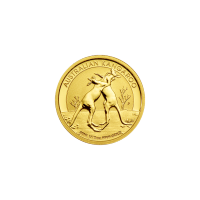 The reverse of the 2010 Kangaroo Gold coin features two kangaroo's in combat with the traditional "P" mintmark. The obverse features an effigy of Queen Elizabeth II and the words "Elizabeth II Australia 15 Dollars". These coins will arrive beautifully encased, ideal for an investment or a gift.